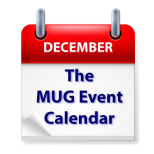 This week’s MUG Event Calendar takes a decidedly festive turn this week. Jean MacDonald of App Camp for Girls will speak to an Oregon group about their projects, and Yosemite will be the featured topic at a California group. After that, groups from England to Michigan, Florida to Nevada will be hosting holiday celebrations. Cowtown Mac Users Group – Annual Christmas Party! Sierra Nevada Apple User Group – Gift exchange, Apple Forecasts & Snaggler Magicians!